This past weekend, we officially rolled in the holiday season at the Olson house! We've been talking to Callum a lot about Christmas, and Santa, and all the other fun things that come with this time of year. So, it was so fun watching him experience all the things we've been explaining. We all know that Callum is obsessed with trains, so we had to be sure that we made it out to see the CP Holiday Train when it stopped in Wauwatosa. Friday night, along with every one else in Wauwatosa, we did just that. The train was scheduled to stop in Tosa at 8:15. We got there around 7:30 and could not believe the crowd! There were so many people. It was insane. I was worried we weren't going to see anything, but the crowd ended up looking worse than it was. All of the people just added to the fun atmosphere of the evening. We met up with some friends (who are also our next door neighbors), and Callum was so happy to be running around with his partner in crime while we waited for the train. The temperature for the night was perfect. Considering the time of year, it could have been much, much colder with snow every where. The second the train rolled in, shortly after eight, Callum got on Matt's shoulders to watch and stayed there the whole time the band performed. If you've never seen the CP Holiday Train, the entire train is covered in Christmas lights, and, at their stops, they open the doors on one of the cars and there's a band playing Christmas music. Callum just stared at the train and danced along to the music. He loved every second of it. At one point, we tried to put Callum on my shoulders for a bit because Matt was getting a little tired. Callum straight out refused. He knew Matt was taller and he could see more up there. After the band played for about 20 minutes, we watched the train pull away. As it was leaving, Callum said, "Love you, train." It was the sweetest. He had such a good time watching the train. We can't wait to see it again next year! Saturday morning, we went to get out Christmas tree and decorated the house. Even though it's a lot more work to clean it up, we get a real tree every year. Nothing beats the smell of a real tree. I think this year is my favorite yet as far as our decorations go! Can I leave them up until March? Sunday night, St. Nick came. 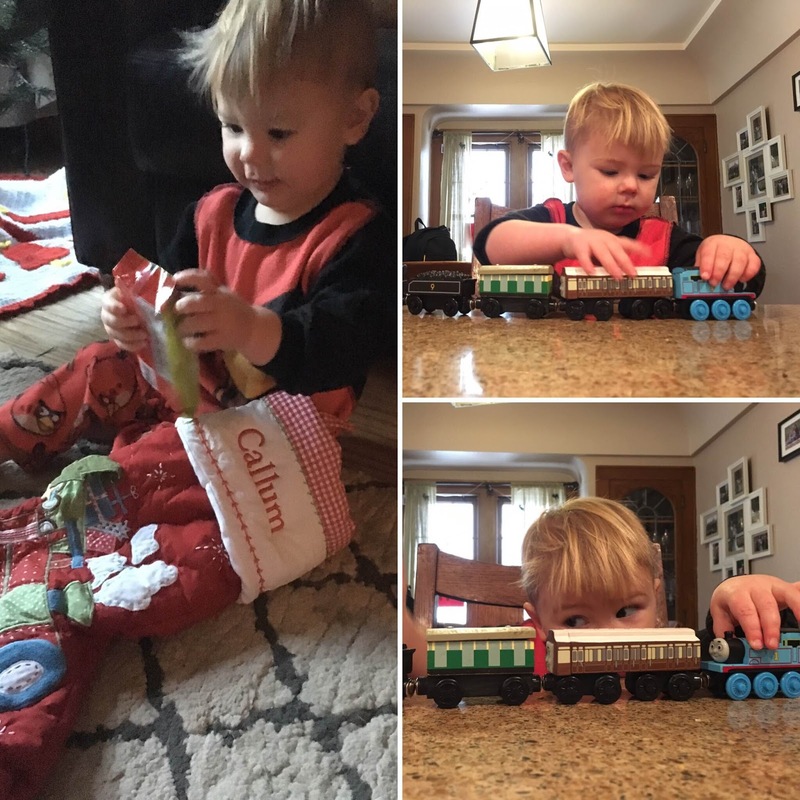 Callum woke up to a few trains (of course) in his stocking, lacing boards, and some candy. Callum didn't quite understand "St. Nick." He thought a friend of ours, named Nick, stopped by with the presents. He didn't care either way. He was just so happy with the new trains, and he hasn't stopped playing with them since. He's even been taking them to bed with him. 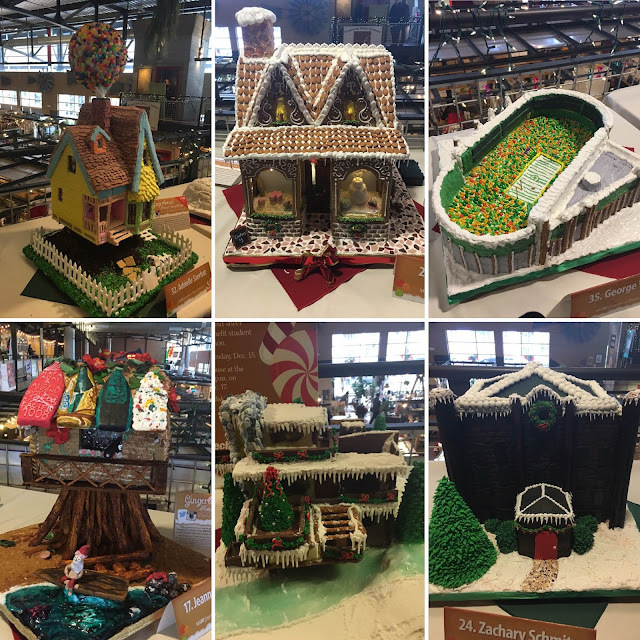 Then, late Sunday morning, we went to the Milwaukee Public Market to see their gingerbread house display. Students from MATC make the houses, and then they are on display at the Market until December 15. 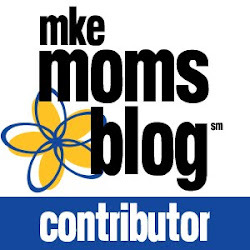 If you're in Milwaukee, go check them out! They were unbelievable. My favorite was a gingerbread model of the house from the movie "Up." It was amazing. This coming weekend, we'll be taking Callum to visit Santa. We've been talking about him a lot, and we've been calling him using an app on my phone. Callum has been asking a lot when Santa is going to come. It's so sweet. He says he's excited to meet the Big Guy and sit on his lap, but we'll see how he does when he's actually there. Whether he's screaming or smiling, we'll be sure to get a good picture. We'll also be decorating cookies with friends and taking a holiday lights tour. Let the holiday fun continue! When I'm looking back at this post years from now, I also want to remember how warm it's been this December! Tomorrow, we're looking at record highs near 50. I've heard many people complain about the warm temps and hoping for a white Christmas, but I am just fine with it. I've been so enjoying the warmer weather with lots of running outside and trips to the parks. I hope it stays this way til April. What're your favorite things to do with your family during the holiday season? Let me know in the comments! I'm also looking for fun Christmas ideas.